Entering into the segment of large agricultural machinery, opened to company Labinprogres -TPS possibility of further growth and development. The positive reaction of the market on placement of the tractor Tuber 40 and Tuber 50 confirmed the decision on the further expansion of its product range in this segment and development of tractor attachments like tractor trailers. Along with tractor trailers PV-3000 and PV-4000, single-axle tractor trailer PV-2000 is the smallest trailer in the program of tractor trailers, but due to its technical features it can be adapted to each customer’s request. In accordance to this feature, small farms can have a trailer optimized for their needs. Single axle trailer PV-2000 is designed for smaller transport operations. It is characterized by low weight, stable structure, high versatility which enables the use on all-terrain, due to construction with a low center of gravity. Its carrying capacity is 2.000 kg with box dimensions of 1500x2500x400 mm. Box tipping is triple, with the opening from the upper and lower sides. Side and back pages are opened via a central lever that allow maximum functionality. The towing attachment may be constructed as a fixed or rotary, with the possibility of height adjustment in four positions, supplied with tires 10.0 / 80-12 10 PR, hydraulic or air brake system. Trailer can be equipped with optional side height of 400 mm. Trailer PV-2000 is particularly suited for small and medium-sized farms, and enables transportation of various types of cargo. 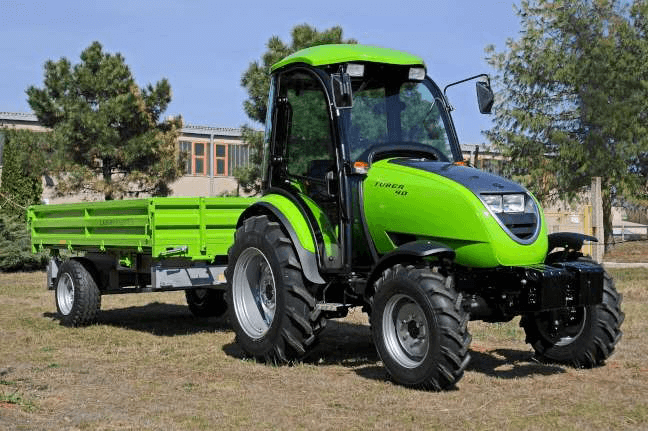 Labinprogres -TPS can offer competitive new agricultural machinery and we believe that the tractor trailer PV 2000 will certainly find its place in the market.